Do you have a sun shade sail in your backyard, or are you thinking about putting one up? Have you been looking into the different types of fabric available for this type of setup? Have you ever considered using canvas instead of polyester or some other fabric for this purpose? Below, we have reviewed a high-quality canvas shade sail that you may be interested in putting up in your yard. Whether you’ve considered canvas before or not, you may be happy with the results when you try this product, so be sure you take your time and check out the information we have listed below to help you decide. Is this really a good option for your shade sail, though? Are triangular canvas awnings the most common fabric for this type of product? It’s common enough to find triangular awnings like this, but finding them in canvas instead of another material can be a little more challenging. However, it’s not impossible, and canvas can be a great solution depending on your specific needs. Just remember that canvas comes with it own strengths and weaknesses, just like any other type of awning fabric. Be sure you pay attention to the pros and cons we have listed below so you can figure out if this type of awning is right for your shade sails or if you need to go with something else instead. Read on to find some great solutions for your canvas shade triangles! The Casa Pura Sun Shade Sail is a high-quality canvas shade that is easy to hang and even easier to enjoy. This shade sail looks great in any backyard and features a classic traditional design that fits in well with any existing shade sails and other backyard canopy elements, too. This fabric is available in a 12x12x12 triangle as well as a few other sizes and shapes you may be interested in. This fabric is thick enough to work well but light enough that it’s easy to hang up and take down as needed depending on the weather. This fabric is 99% UV protective, which is much mor than some of the other products out there. 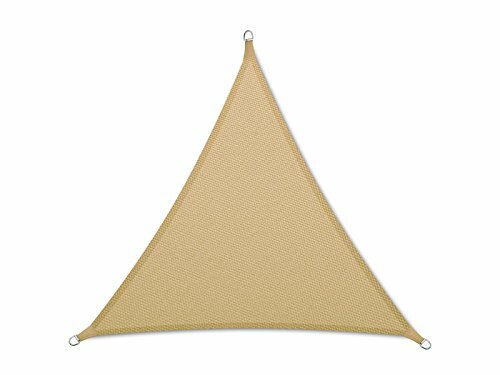 We like the durability of this canvas shade sail triangle. Since it’s made of canvas, it’s naturally less likely to mildew or mold than some other types of fabric, but it is also made from a very high-quality canvas that improves this even more. It’s also resistant to tearing and other damage related to exposure to the weather, and since it’s UV-resistant, it doesn’t fade out when used in the sun. Overall, we think this is a great durable shade sail that’s sure to last you for a long time. We feel that, like most canopies made of canvas, the biggest downside to this product is that it isn’t waterproof. It would be possible for the company to waterproof this fabric and save the customer some money and effort, but this particular shade sail is not waterproofed at all, so it’s important to know this going into buying it. You will need to take steps to waterproof it yourself, or you may just prefer to use it for shade only and take it down when it’s going to rain a lot, instead. This shade is available in two different colors and tons of different sizes and shapes to help you find the right fit for your yard, garden, pool, or patio. The sail is designed to be easy to hang with or without help from another adult, as long as you already have the poles in place to support it. The canopy comes with metal D-rings and cords to make hanging it even easier than ever before, which is especially nice since you don’t have to worry about buying these extra items. The fabric is sturdy enough that it doesn’t sag in the middle from rain or snow. You will need to always take this shade sail down when it’s going to rain or snow for a long period of time or during more severe weather situations, like hurricanes. This shade sail may arrive with some stitches missing or out of place in some rare instances, although the company will take care of it if this happens to you. Over time, you may need to replace the included D-rings sooner than the rest of the shade sail, as they may potentially rust or break. If you’re looking for a more unique color for your shade sail, you may need to look elsewhere. As you can see, canvas may not be for everyone, but it can be a beautiful and traditional option that looks great in your yard. The aesthetic appeal of a canvas shade sail triangle is excellent, but if you’re in need of something more waterproof and capable of protecting your furniture (or your family) from the rain, then you might want to go with something else. Of course, you may be able to make this type of product waterproof if you’re willing to spend a little more time and effort on it. You can purchase a waterproof sealant that you spray or paint onto the fabric to help make it a little better at keeping the rain out. Of course, this isn’t a perfect solution, but it can make a big difference overall. Just remember that, if you do this, you’re going to have to repeat the process about once a year to make sure the waterproofing sealant doesn’t wear off too badly. It’s also important to remember that cleaning canvas is a little different than cleaning polyester. Overall, the process is more or less the same, and you can use mild soap and water to do most of your cleaning. However, if you choose to use a store-bought fabric cleaner, you’ll need to pick something designed specifically for use with canvas. You also need to remember that canvas can shrink, so you should refrain from using it in any high-heat situations while it’s still wet from being cleaned. One of the nice things about canvas is that it can be repaired very easily, so keep this in mind when you’re trying to make up your mind, too. It’s easy to patch or stitch up torn canvas, and you may be able to extend the life of your shade sail much longer by doing this as needed. In the end, the decision is entirely up to you. However, canvas can be a great solution for anyone looking for a unique take on the shade sail.